Fear: It’s a word that comes up again and again when former Muslims, Buddhists or Hindus speak about their former religions. Fear of ghosts. Fear of angry gods. Fear of never doing enough to earn eternal reward. But all that changes when someone tells them about Jesus Christ. 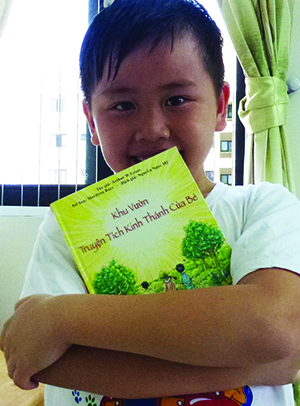 Danny, a young Lutheran in Vietnam, hugs his copy of the Vietnamese “A Child’s Garden of Bible Stories,” sponsored by the national LWML. At the 2013 and 2017 national conventions, LWML members voted to adopt two Lutheran Heritage Foundation (LHF) mission projects. Through your national LWML mission mites, you have assisted LHF in translating and printing thousands of Bible storybooks and Luther’s Small Catechism for children and families around the world. In the pages of these books, children lost in spiritual darkness have seen the Light of the Savior. As parents have read the books, translated into a language they can understand, the Holy Spirit has called them to faith – and peace – in Christ Jesus. • Rev. Ted NaThalang, born into a Buddhist family in Thailand before his stepfather introduced him to Jesus. YOU CAN TELL YOUR LWML GROUP ABOUT THIS EXCITING WORK GOING ON AMONG NEW LUTHERANS AROUND THE WORLD – AT NO COST TO YOU. • An 8-minute DVD telling about the LWML’s partnership with LHF to introduce Jesus to children living in Muslim, Buddhist and Hindu areas of the world. • A short accompanying devotion and prayers. • A photo display featuring children who have received Bible storybooks from LHF and the LWML. • “Jesus Never Fails” bookmarks for each of your members. • Easy recipes for treats from Africa, India and Asia you can serve at your meetings. • Information on how to request an LHF speaker for your zone meeting. Call (800-554-0723) or e-mail LHF to order your free kit today! You’ll receive your “Jesus Saved Me” kit within just a few days of your order. For links to LHF’s resources for the “Jesus Saved Me” LWML mission project click here. Click here to learn more about the effects of your district’s grant.